Poetical Drifts of Thought or, Problems of Progress. Treating Upon The Mistakes of the Church - The Mistakes of the Atheist Infidel and Materialist - God Not the Maker of the Universe - Progress the Evidence of a Merciful But Not All-Powerful God. Reconciliation of Science and Christianity. The Formation of a Solar System - Evolution - Human Progress - Possibilities of the Future - Including Spicy Explanatory Matter In Prose. Embellished with Nearly 200 Illustrations. Together with a Number of Fine Poems on Popular Subjects. Including Sketches of the City of the Straits - Past, Present and Future. 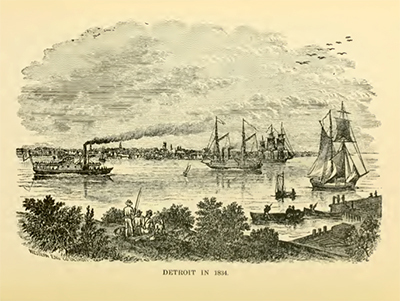 Speramus meliora; resurget cineribus (We hope for better things; it will arise from the ashes”) - Motto of Detroit. Current reports of Detroit's collapse are premature. 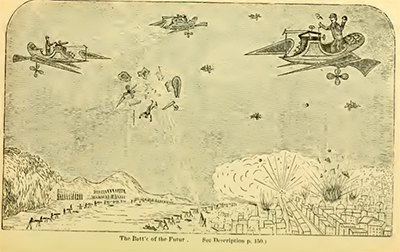 Lyman E. Stowe, a citizen of pre-Motor City, saw the present in 1884, was pleased, and predicted a future for the metropolis that makes anything H.G. Wells ever wrote seem the product of a pedestrian mind completely lacking in imagination. 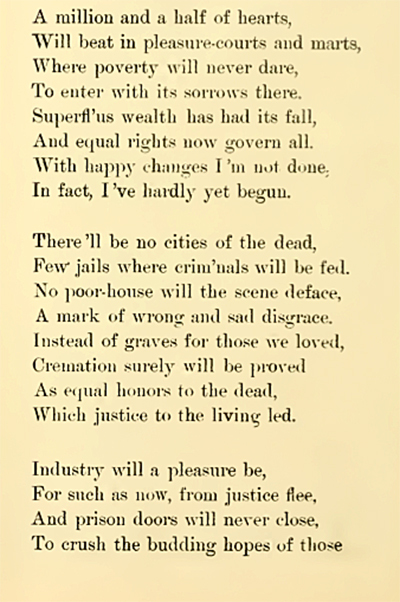 The first three of fifty-five stanzas to be recited to the tune of Yankee Doodle. It's a future based upon electricity, chemistry, the abolition of ignorance, and the reconciliation of science and religion. It's a future told, for the most part, in poems that threaten the very existence of poetry. Scansion, smansion, who needs it? 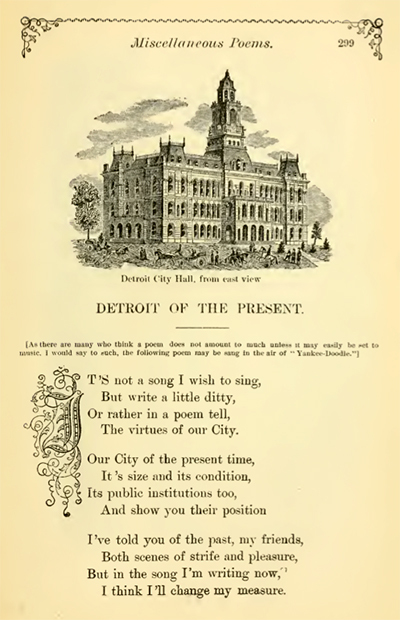 When you write fifty-five quatrains in praise of Detroit's present and direct that they be recited to the tune of Yankee Doodle, Erato sticks a feather in her cap, calls it macaroni, gets buried in poetical snowdrifts of thought and prays for a St. Bernard to find her beneath the avalanche. 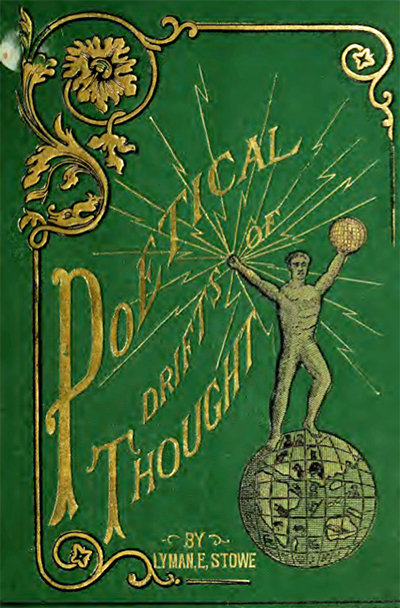 Poetical Drifts of Thought is one of the many eccentric self-published works of American 19th-century imaginative writing yet it stands out from the usual crowd of crazy texts by sewing utopian literature, futurology, freethought, Swedenborg, Darwin, and social engineering into a crazy quilt that just won't quit. Lyman E. Stowe was a rugged individualist in the sea of rabid individualists that emerged during the Second Great Awakening in the United States, when the American ethos of individualism met evangelicalism and singular opinions and beliefs were tossed into a Christian fruit salad to present to the world a medley of motley ideas, many radical, in search of acceptance by someone, anyone - please listen! 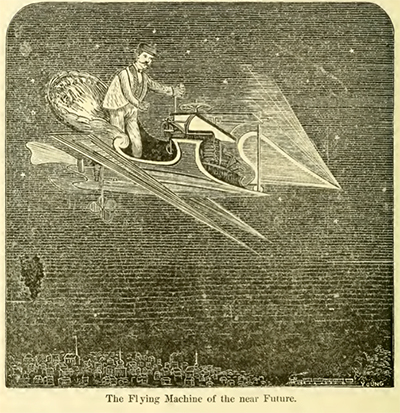 The Flying Machine of the near Future. ...and travel by cars through underground pneumatic tubes. And you thought Elon Musk's Hyperloop was futuristic? Late! Food inhaled, not eaten, with acid-reflux vanquished. Inhaling nutriment in gaseous form via electrical and chemical process. How 'bout the replacement of solid foods with “nutritive gasses”? Combined with nitrous oxide for belly laughs? 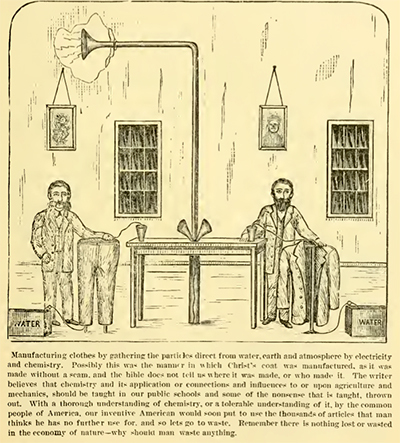 water, earth, and atmosphere by electricity and chemistry. Clothes may make the man but in Detroit's future man doesn't make the clothes. 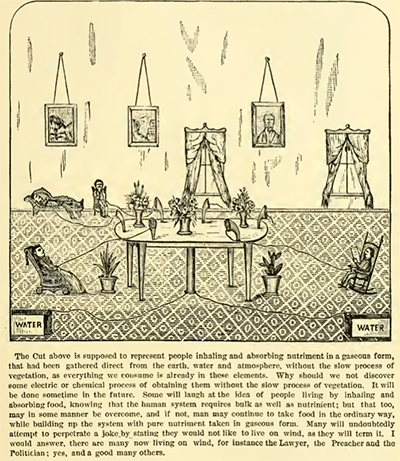 In a stunning blow to the Amalgamated Clothing and Textile Workers Union, clothing will be manufactured using a combination of electricity and chemistry to process particles of water, earth, and atmosphere into a three-piece, custom-made 100% merino wool canvassed suit with structured waist, single vent, hand-rolled lapels, padded shoulders, and handsome silhouette. 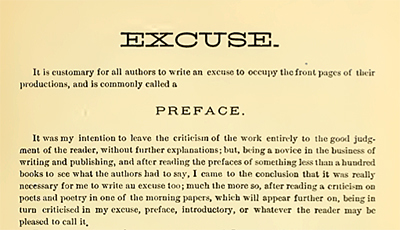 Preface as excuse for the book. Typical in books of this nature, the author has his own ideas about book format and punctuation. Since he believes that a preface is nothing more than an excuse for a writer to rev-up before mouthing off, he calls it like he sees it. Then makes his excuse for writing the book. to be inserted by the reader where appropriate. Stowe makes every attempt to be scrupulous with crediting other writers "but for fear that I might sometimes miss, I place these large quotation marks, large enough for all to see, and ask the fastidious reader to place them where they belong." In short, he leaves the copy editing to the reader. Eden on Lake Michigan in the year 2100. 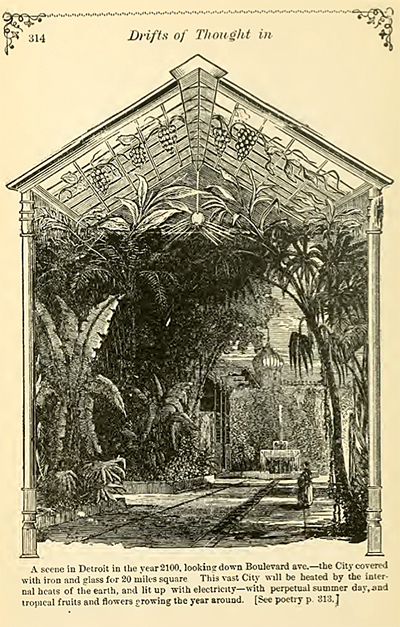 Current denizens of Detroit will be pleased or piqued to learn that in the year 2100 they will become peasants under glass, sharing life with hothouse flowers and exotic fruits in a greenhouse gotham where it's sunny, warm, and wonderful all year 'round. flowers growing all year 'round. They float and breathe the perfumed air. Here, Stowe apparently references The Funk Brothers, the uncredited and largely unheralded studio musicians who were the house band hand-picked by Berry Gordy in 1959 for Detroit's Motown Records. who would undermine the Bill of Rights. You'd think that one who envisions a paradise city under glass would avoid war - the results would be shattering - but no. Aeriel ballets with bullets n' bombs will still have their place as long as man has an immortal soul. "The mind is but organized matter, there's no immortal soul. In a blow, however, to Christianity as we know it, Christian Lyman E. Stowe asserts that "the mind is but organized matter, there's no immortal soul," a strange sentiment from an anti-materialist but "a foolish consistency is the hobgoblin of little minds, adored by little statesmen and philosophers and divines" (Ralph Waldo Emerson). Discovery of the Art of Renewing Life. Then again, who needs an immortal soul when life can renewed as if a subscription to LIFE magazine? I see Ford's River Rouge factory repurposed, renewing life on an assembly line. In what will be major news to the faithful of all monotheistic religions, Stowe asserts that God didn't make the universe and God's not All-Powerful. Then who, Henry Ford? (Ford thought so). 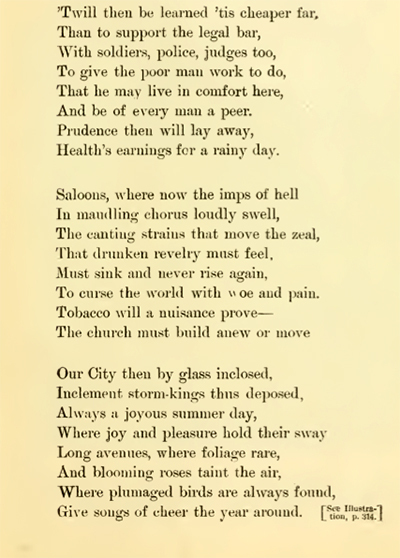 Other books by Lyman E. Stone include: My Wife Nellie and I; a Poetical Sketch of Love and Fancy with Other Poems, Including Blank Lines for Autograph and Remarks (1895); What Is Coming is a Wonderful Exposition of the Prophecies and Comparison with Ancient and Modern Historical and Political Events Together with an Ample, Though Concise History of Money from King Solomon's Time to the Present (1896); Stowe's Bible Astrology: the Bible Founded on Astrology (1907); Astrological Periodicity: A Book of Instructions, Showing Man, Beast and Plant are Subject to the Influences of the Planets ... [which gives good and evil periods, which can be taken advantage of and be a benefit, not only to the individual, but to all classes of people (1907); Right Hours to Success (1907); Karmenia; or, What the Spirit Told Me, "Truth Stranger Than Fiction" a Series of Short Occult Stories, Real Experiences During the Life of a Man 72 Years of Age, Garnished in the Clothes of Fiction (1918). All to be read to the tune of Yankee Doodle. As for Poetical Drifts of Thought, "The book is what the title implies - 'Drifts of Thought.' You say you don't believe it or agree with it all. Well, I don't blame you, for I don't know as I do my self. Yet my theory is grounded upon logic that seems indisputable within the bounds of anything come-at-able. "We all have a right to express our thoughts, and by free expression of our thoughts we learn from one another, but I must now say for the present, Good By. Good By." See you later, alligator. Bankruptcy? Don't have a goiter, you Detroiter. This, too, shall pass - like that gaseous meal you just inhaled. 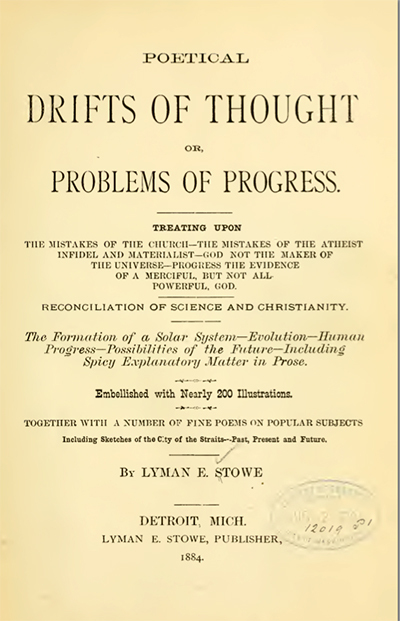 STOWE, Lyman E. Poetical Drifts of Thought or, Problems of Progress. Treating Upon The Mistakes of the Church - The Mistakes of the Atheist Infidel and Materialist - God Not the Maker of the Universe - Progress the Evidence of a Merciful But Not All-Powerful God. 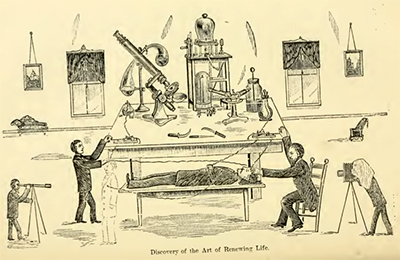 Reconciliation of Science and Christianity. The Formation of a Solar System - Evolution - Human Progress - Possibilities of the Future - Including Spicy Explanatory Matter In Prose. Embellished with Nearly 200 Illustrations.. Together with a Number of Fine Poems on Popular Subjects. Including Sketches of the City of the Straits - Past, Present and Future. Detroit, Mich.: Lyman E. Stowe, Publisher, 1884. First edition. Tall octavo. 319,  pp. Illustrated throughout with woodcuts. Publisher's gilt-pictorial green cloth over beveled boards. Not in Negley, Utopian Literature, nor in Sargent, British and American Utopian Literature.